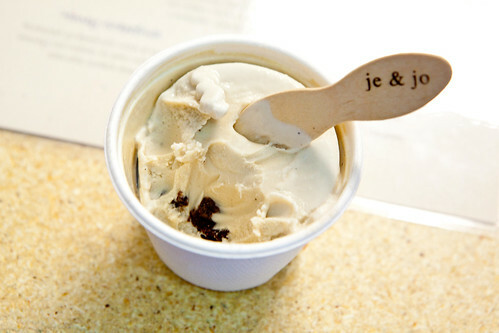 Je & Jo is a small batch, artisanal ice cream company that I remembered a while ago a friend of mine mentioned about this cute little stall she saw around the Upper West Side Farmers’ Market about a year ago that had pretty darn good ice cream. I mentally filed this piece of information in my mind and hope to find it when I’m around the Upper West Side, when the Market is up and running. Alas, my schedule prohibited me from doing so – that’s until two weeks ago, I read the New York Times mentioning Je & Jo’s opening in Hell’s Kitchen. Since summer is started to kick into high gear eating ice cream at large quantities won’t be an issue and made my visit there. When you walk over toward 11th Avenue on the far west side of Midtown Manhattan, you’ve realized you’re practically walking over toward Jim Lahey’s highly respected, Sullivan Street Bakery. 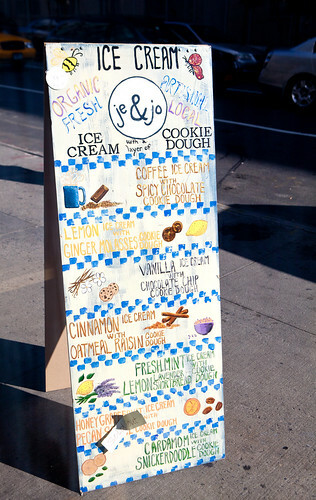 Je & Jo’s is just a few doors before the famed bakery. When you enter this ice cream shop, the interior was quite spartan (during the second day of opening). A wooden bench along the wall that has their ice cream menu painted, and two director’s chairs at the window. 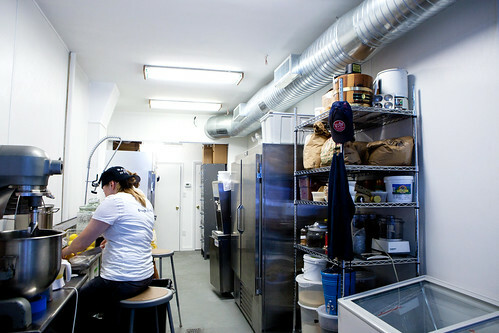 The open kitchen is filled with -20 freezers in the back, a commercial-sized stand mixer, and shelf full of hand chosen ingredients for their ice cream and cookie dough recipes. Before I get into the details of each ice cream I tried, you have to understand the concept of this ice cream brand. 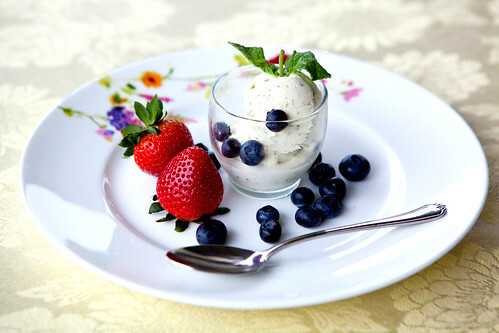 The idea is to be playful and be nostalgic with ice cream but made with premium, organic ingredients. You won’t see the typical freezer display full of colorful ice cream flavors stored in stainless steel pans. What you end up buying is the nostalgic ice cream cup (eco-friendly compost-able cups, if you want to know) for $4 each. 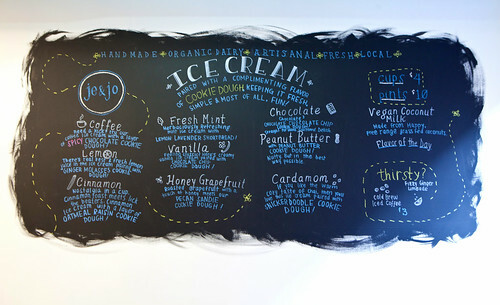 It is all about simplicity and focusing on the densely packed, flavorful ice cream and cookie dough, driven on using the best local ingredients. Got it? Good. Staring at their ice cream menu wall, I was indecisive as to what I really want to try first. At the suggestion of one of the employees, she said her favorite was the cardamom ice cream. So, I listened and tried it. 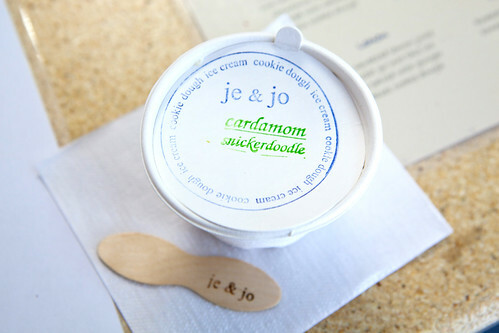 The cardamom ice cream with Snickerdoodle cookie dough was an intriguing flavor combination. The ice cream was creamy and wonderfully warm and earthy. The chewy Snickerdoodle cookie dough picked up on the subtle spice notes. I have never envisioned those two flavors together until now. I am a big fan of mint and lavender but not necessarily eaten together in my lifetime. 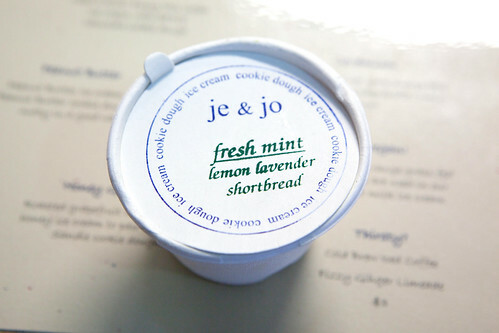 The mint ice cream with lemon lavender shortbread cookie dough was pretty damn awesome. The mint was insanely fresh. It tasted like someone went to the farmers’ market in the morning, made the ice cream base, froze the batch and sell it the day of making it. 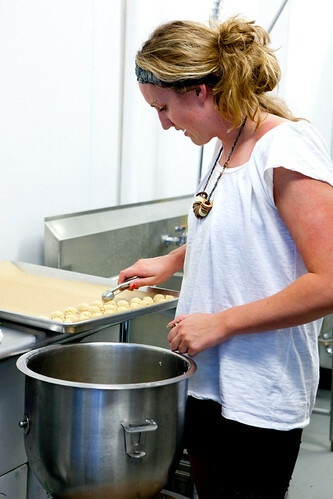 The lemon lavender shortbread was an easy favorite of mine as I love those two flavors combined. When you have a bite of the ice cream and cookie dough, it’s a total win. As my stomach is teetering to the full point, I really wanted to try a cup of coffee ice cream with spicy chocolate cookie dough before leaving just because I’m a coffee fanatic and I love chocolate. The coffee flavor was rich and robust from using a really dark French Roast coffee beans to infuse into their mix. The spicy chocolate cookie dough did have gentle, multidimensional tingle of heat in the back of my throat. I found out that there’s a mixture of three peppers mixed into the dough. The overall mouthfeel was dark and rich with a touch of spicy to make this particular flavor interesting. 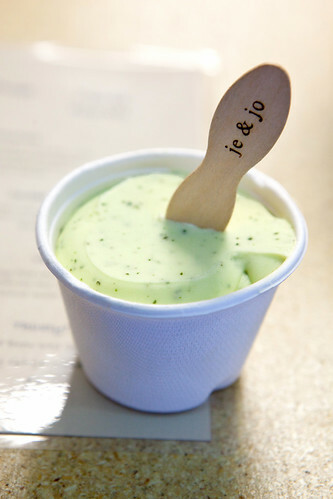 I was enamored with Je & Jo’s superb mint flavor ice cream that I had to pick up a pint ($10) before heading home. Jennifer did warn me that the pint I’m bringing home lacks the fun part – the cookie dough. To me, the ice cream trumps the cookie dough (the latter part is a bonus). The mint was beautifully nuanced without being too herbaceous or sweet that I need to share it with friends for my July 4th afternoon tea (hence the above photo) and tell them how awesome it is. As I expected, they were “ooh-ing” how amazing it was and thought I went through my phase of my crazy/obsessive streak of making ice cream like last year. Except, I told them I haven’t (yet) and disclosed that I got this from Je & Jo’s. It brought a moment of silence but it erupted with praise that they would consider going out to their Hell’s Kitchen location soon to grab a cup or pint. A possible tip when you venture to Je & Jo: Pick up an excellent sandwich from Sullivan Street Bakery then a cup of Je & Jo’s cookie dough studded ice cream. Walk over to the nearest park (there’s one on 11th & W 52nd) or to the docks to have a picnic. This ice cream shop looks like absolute heaven and I want to go BADLY… shame I live on the other side of the atlantic!! Thankyou for this piece though, I had fun imagining! Ellie Oh darn! 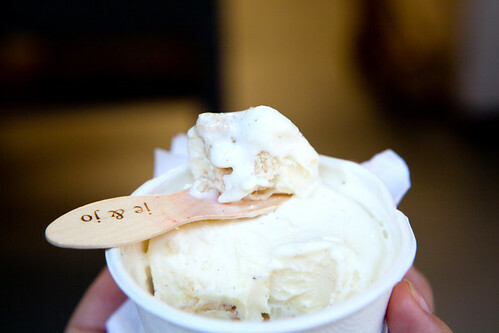 If you could visit NYC, this is a great ice cream shop to indulge. Very to see more and more artisan ice cream shops thrive. TripleScoop It is great to see more artisan ice cream shops trying to make it out there. I hope it would change the way people think from what is mediocre/good ice cream to great ice cream.